1. Don’t stick to the textbooks. Read widely! In particular, read around disciplines that border on psychology (philosophy, sciences, social sciences, business, and others). Also learn about the history of psychology and its development (for example, see the ‘Looking back’ articles in The Psychologist each month and at www.bps.org.uk/lookback). Having a view of where psychology comes from and its context will help you develop your own views. It will also open up more possible career options when you realise what areas psychology has impacted on and grown out of. 2. Physician, heal thyself! Apply what you learn to your own learning and career choice. How does psychology illuminate your own thinking, behaviour and relationships with others? Employers (including for more general roles) really value psychologists’ thinking skills and ‘meta-thinking’ – their ability to think about thinking. Graduate recruiters also increasingly look at graduate social skills in addition to their ability and knowledge. Inter- and intra-personal emotional intelligence are valued commodities in all sorts of organisations. Fast-track graduate recruitment schemes look for candidates who can show evidence of people skills. 3. Get a job (or jobs). Psychology students have very high levels of employability but it is competitive out there, not least because psychology study is a growing area. Take every opportunity to get internships and work experience. If the job is not psychology-related then try to apply psychology in it. Some universities offer routes to these placements. There will often be lots of local jobs and/or volunteering opportunities available through your university or student association. 4. Take the initiative. Don’t wait for job adverts or advice from the university. If you want to get some job experience, write to local companies, ring their HR departments or MDs. You’ll get rebuffed, but you’ll occasionally get real interest and people impressed by your initiative. 5. Think local, act local. There are almost certainly local networks and groupings of psychology students and practising psychologists in your area. The Society website (www.bps.org.uk) can introduce you to local networks in its ‘Networks and communities’ section. You will get useful feedback from the Psychology Postgraduate Affairs Group (PsyPAG) and Student Members Group (SMG), when you’re considering options for further education and training. Groups of local practising psychologists might be very happy for you to attend meetings, and you’ll get fascinating advice from those who are actually doing a particular kind of job. People often say that their courses do not prepare them for the reality of the world of work: practitioners can make up for this lack. You might even find a mentor or facilitator who takes a particular interest in your career. Interviews in this section often show the importance of this role. 6. The skills you didn’t know you had. Psychology students learn broader transferable skills than almost any other undergraduate group, including: teamwork, structuring an argument, report writing, statistical techniques, creativity, problem solving, research skills, time management and varying immersion in IT. Managers need to understand ‘how people work’ and psychology students have a head start in this area. 7. The approach you didn’t know you had. Students tend not to realise the importance of the professional ethos they learn on their courses. Psychology training stresses ethics, social responsibility and appreciation of the importance of equality and diversity. Students are also taught to observe limits and avoid over-claiming. Employers (as has been emphasised in recent interviews for this section) recognise these as real strengths of those trained in psychology. 8. Your Society can help you! The BPS generally and the Psychology Education Board (PEB) of the Society in particular can offer a number of systems and publications that can supply help and advice for students. PEB has just approved the terms of reference for a standing committee of students and already offers prizes (e.g. for the highest scoring final-year student on each accredited degree course, for the best Psychology Teacher). Psych-Talk is a magazine written by students for students. See the latest issue via tinyurl.com/42ocvo4. Go to www.bps.org.uk/careers and you’ll find it packed with useful advice and information about career choices, and www.psychapp.co.uk has the latest jobs. Bookmark the sites early in your degree and go back to them frequently. The world of work is changing fast, as is the world of psychology. 9. ‘A foolish consistency is the hobgoblin of little minds.’ Most students will change their minds about their ultimate career aims during the course of a degree. Don’t decide too early and cut off options. Half way through the course, either search for, or give yourself a reality check. Are you really committed, enthusiastic and ‘good’ enough to commit to a long-term Chartership route? 10. Admit your ignorance. There are some things you simply can’t learn in a three-year psychology degree (though four-year degrees make it somewhat easier to do this). Don’t go into job interviews assuming you have nothing to learn. It will look arrogant. 11. Get connected: The world of work is increasingly using Facebook, Twitter and LinkedIn as a major means of communication. The latter, in particular, is a very rich resource with discussion groups on every topic imaginable, many of which feature questions from students about how to get a job. Time spent on such sites will help you whether you’re searching for your career or an interim placement but it’s important to remember that a professional online forum will have its own strict etiquette. 12. Don’t be afraid to advertise yourself. All of the above would be irrelevant unless you get your CVs and application letters right. Tailor each application to the particular job you’re applying for. Don’t use a standard version. And anything you’ve done during your course or in your work/volunteering could be useful evidence that you can offer the employer. Many employers want your individuality and passions to shine through. There are lots of resources on the web and many books on how to approach applying for a job and interview technique. Read some. Your psychology training will provide you with some techniques: applying for and winning a job is a piece of applied psychology. But don’t assume you know everything: this is an area with a highly developed etiquette and also ‘fashions’ in areas such as CV design. 13. Are you an Alan Sugar? Many psychologists set up their own businesses or become self-employed, either initially or after a period in private or public sector employment. It may seem irrelevant to the main areas of a course but time spent studying the basics of business is time well spent. 14. To boldly go… Newer psychological applications and their formalisation into divisions or special interest groups are opening up new career paths, as this careers section has shown over the last five years. Examples include sport, coaching, economic, consumer and marketing psychology, among others. 15. Join the Society! Consider getting the weight of the Society behind your studying and career journey. See www.bps.org.uk/join for more details. The Society has a range of resources available to help students through their degree and prepare them for the world of work. The Research Digest blog at www.researchdigest.org.uk/blog is the current holder of ‘Best blog’ in the international Research Blogging Awards, and it’s a great way to keep up with the latest research and get an idea of how psychology is put into practice. Via the blog you can subscribe by RSS or e-mail, become a fan at Facebook and follow on Twitter @researchdigest. The Psychologist is sent to members of the Society each month. A valuable archive, stretching back to 1998, is available along with other features at www.thepsychologist.org.uk and open access samples are available at www.issuu.com/thepsychologist. Follow The Psychologist on Twitter @psychmag. 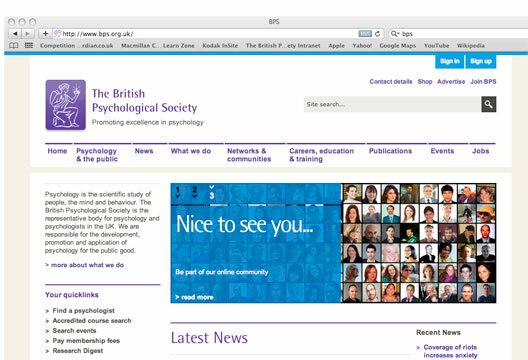 There are many more benefits for members of the Society: see www.bps.org.uk/membership and follow the Society’s official Twitter feed @bpsofficial. Students who are not earning a taxable income can join the Society for just £21. See www.bps.org.uk/join.